Expression Club of GLBIMR is a Platform where enthusiastic students will meet and synergize their energies to bring out and live every emotion that their life must offer. 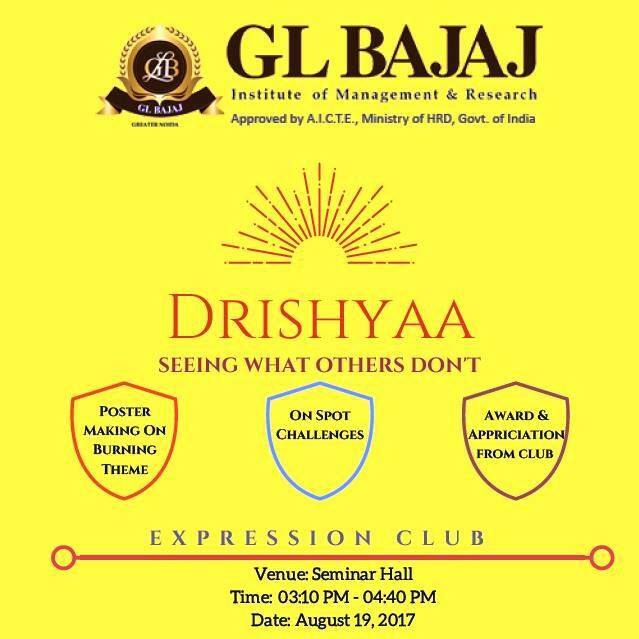 The first inhouse activity of this club is DRISHYAA, which will be a lively event, comprising of poster making & skit presentation. The event is on August 19, 2017 in Seminar Hall, GLBIMR. Both the Batches of PGDM can participate. So what are you waiting for... Register now!! For registration plz get in touch with faculty incharge - Ms. Radhika Malhotra.